As part of Software for Geeks on-going series, earlier I wrote about Web based To-Do List Software. 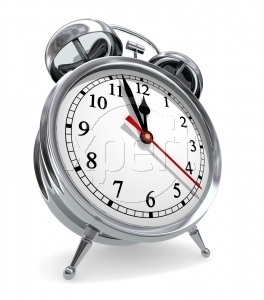 In this post, let us review about Web based time tracking software. For geeks to be ultra efficient and productive, it is very important to cut down the time spent on activities that are not aligned with your goals. If you track daily activities either manually or using some software, you will be surprised to find out how much time your may be spending on activities that don’t need such attention. Take a test drive of the following two free online time tracking software and pick the one that suites your need. 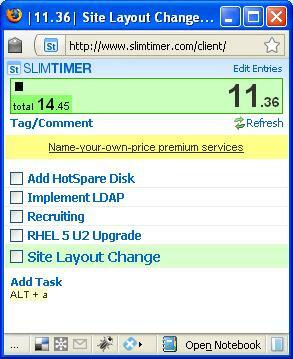 If you like simplicity, you should try SlimTimer. The user interface is very clean and has only the necessary items required to track your tasks and time. Open the slimtimer either in a sleek browser pop-up or on the browser side-bar. Click on a task to start the clock and click again to stop the clock. This displays both the cumulative time spent on a particular task and the current running time. Click the check-box next to the task once you area completely done with the task. It sends the updates about the time to the server every 10 minutes. When a task is running, you can create a tag for the current running time-slice of that particular task. So, within one task you can have as many tags as you would like. This is much useful than trying to organize it with the Project, Client, Task hierarchy. There are lot of additional features available such as sharing your tasks with others, generate powerful reports etc. The most simple and extremely useful feature is that it displays the running timer and the task name on the browser window title. So, when you minimize the pop-up, you can see the timer running on the task bar in the format of |time|task name. In the following screen shot, “Site Layout Change” task is selected. In the browser window title, it displays “|11:36|Site Layout Change”. When you minimize the window, you can tell how much time was spent on your current task without opening this window by looking at the task bar. 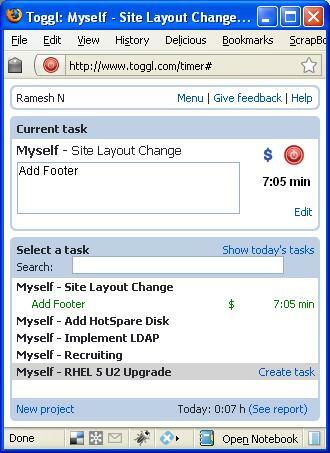 You can maintain the Project, Client, Task, Time relationship using Toggl. Before you start the timer for a task, you should create a project and associate with a particular client. Please note that the client is mandatory. So, you can create a client called ‘Myself’ to track your personal projects and tasks. This also opens up a sleek browser pop-up from where you can start your timer for a particular task by clicking on it. This pop-up displays all the projects and their associated tasks, which can get little cluttered if you have too many projects/tasks. You have the ability to search for a specific task directly from the timer pop-up window. This has additional features to effectively collaborate between different teams and customers. There is also a desktop version of Toggl available for windows only, which requires .NET framework 2.0. On a final thought, I strongly recommend that you give some serious thought about the way you spend your time everyday. Track your time for a week, using one of the above web based time tracker and review where you are spending your time. Eliminate all the time-wasters and focus on completing projects and tasks that are meaningful to you and aligned with your goals. Nice review of slimtimer and toggl! I’d just like to add one: TSheets. TSheets is a similar product with a variety of Time Tracking options. Use it as a personal time tracker, or for tracking an entire staff. With their recent Jott.com integration and iphone app you can take your time tracking with you where ever you go! This tool is new to me. Never heard of web-based time tracking. Will definitely try them. Even i haven’t heard about this. Will try it. If you are looking for a more comprehensive time tracking service than the list above and that includes task management, check out Intervals. http://Life-log.com – another online daily activity tracking, time management, achievements and process tracking tool. It really corresponds to human’s life reality – i.e. only one activity at a time. It is based on a chess-clock principle – you press on an activity button – you start it (and the same time you stop previous one). Life-log.com also gives an opportunity to track all the previous life (the best and the worth moments, ups and downs. Plus you can track fitness/calories/money etc. Try using ACTITIME. It rules!